This really seems to be the way it is now a days. As trends change, companies are trying to stay fresh in the minds of consumers. Often enough being relevant comes at the expense of innovation. 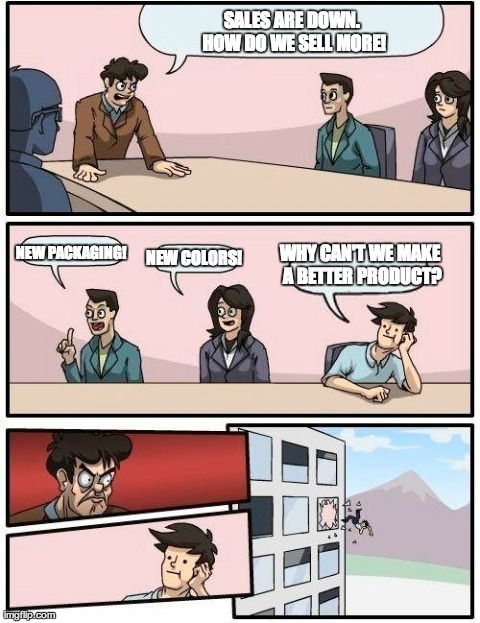 When nothing has changed with a product, you need to start getting creative. You need to get creative in your marketing, however you come to a point where the latest marketing craze or innovation, really is nothing special. A lot of people call these gimmicks, and I can’t say I disagree. In particular here are three “product updates” released in the past year. If these have really boosted product sales, I’m terrified for the future of humanity. Do you feel these ads really work for consumers? Are people switching from Coors to Bud just so they can reseal their beers? (Yes, Coors has a 16 oz. resealable aluminum bottle. I’m well aware and very fond of it!) Does Hood have it all wrong with their twist off tops? Back in my day it was a pop off top! It took years to get used the twist offs! Either way, do you know of any other products that have similar “updates” that are brought to market? Please comment below! 2 Responses to "Marketing Thinks You are an Idiot"
This is what I like to refer to as “Making chicken soup out of chicken sh*t”. This is how Marketing earns it’s keep. And yes, I think these re-packaging ideas and their subsequent ads work for a large enough consumer audience to make them worth their while. Companies are always looking for a reason to engage with their prospects and if you can’t make the product better or different because the consumer expects it to look, smell, or taste a certain way, then these “gimmicks” are the only thing that’s left to differentiate themselves from their competition. Thanks for the post Chris, I’ve often asked myself the same question. George, You’re absolutely right. I’d still love to see if there was any impact on sales because of these innovations, or if the company should have released a general product video, similar to what Coke and Pepsi do every so often.